Configuration Management facilities are available directly from within Microsoft Word and Microsoft Excel, including document check in and check out and report generation. 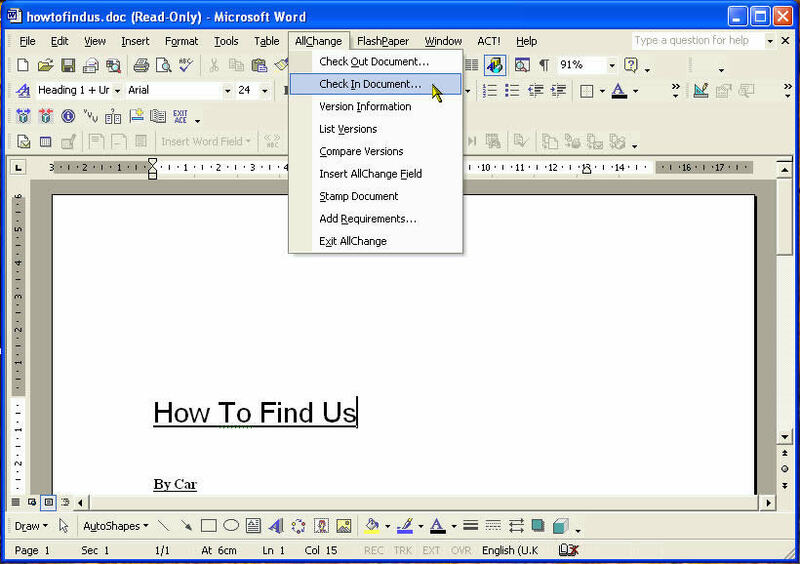 The integration supports Microsoft Word and Excel 97 and later (reduced functionality is also available for Microsoft Word 6). It is implemented as templates and add-ins which add an AllChange menu (to the menu bar in Word and to the Tools menu in Excel) providing access to the interface functions. Check In: Allows the current file to be checked into AllChange using the Check In function. Check Out: Allows a file to be checked out of AllChange and opened as the current document/workbook using the Check Out function. Compare Versions (Word only): Allows 2 versions of the currently active document which corresponds to a part in AllChange to be compared. If no document is open, then you will be prompted to check one out in order to proceed with the compare against the newly checked out component. Version Information: Runs a predefined report on the part which corresponds to the currently open file. As supplied this will report on the issue status of the file. This report may be tailored to site specific requirements. List Versions: Shows a list of the versions of the selected files together with the date that each version was created. Insert AllChange Field: Provides facilities to insert information about the version of the document/workbook from the AllChange database. Add Requirements (Word only): Allows Change Requests to be imported into AllChange from a word document (which may be a requirements document). Generating Reports:Certain AllChange reports may be generated from a Word Wizard which is supplied with AllChange. Exit AllChange: Allows the currently running AllChange session to which Word is connected to be exited. Microsoft Project: The integration allows information about AllChange Change Requests to be exported to Microsoft Project. This enables you to monitor the progress of Change Requests comprising a project, with MS Project features like Gantt charts.